Buckley will work colleagues Andrew Merchant (University of Sydney, Australia) and Carel Windt (Forschungszentrum Jülich, Germany), who will visit his lab in 2019 and 2020 to set up a benchtop NMR system that measures leaf water content in real time, on intact, photosynthesizing, and transpiring leaves. They will use the system to make repeated measurements of water potential on intact, transpiring leaves for the first time, to resolve important questions about how water potential affects parameters of leaf function such as hydraulic conductance, photosynthetic capacity, and stomatal conductance. 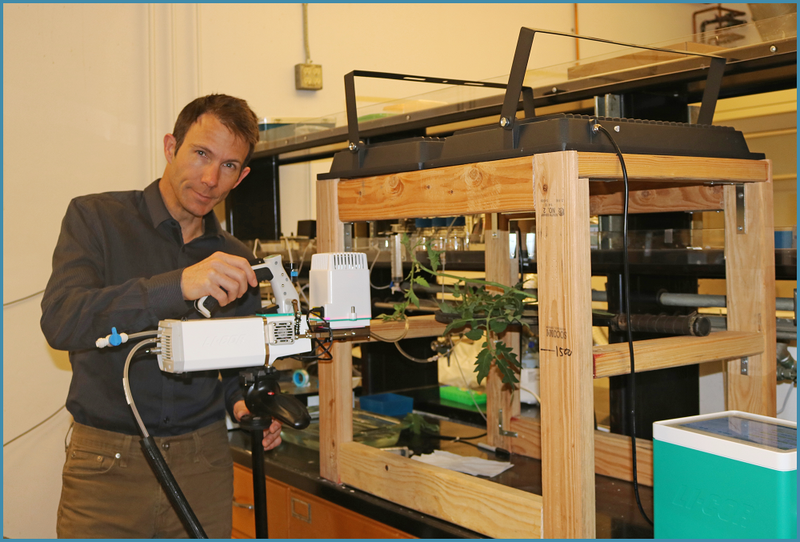 “The questions we’re hoping to answer involve fundamental features of how photosynthesis and water loss are affected by water stress in living plants,” said Buckley. “To date, we have only been able to address these questions using destructive methods that combine measurements on active and inactive leaves and cannot be repeated on the same leaf. Buckley plans to leverage the experimental results into major external funding, and further develop their international partnership. The Global Affairs Seed Grants for International Activities has awarded funding to over 205 UC Davis programs in the last several years.